With the rapid development growing in all directions out of Jeju city, it is easy to forget about the city Jeju once was. However hidden amongst the rapid change, there still lie traces of this old city. 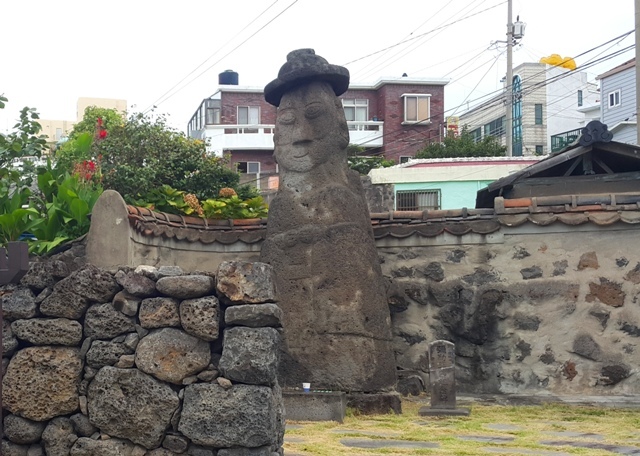 In an effort to pass on some knowledge about Jeju’s hidden history, Jeju researcher Tommy Tran was kind enough to lead a tour around some of these hidden spots. This was part of the Global Youngdeung Gut Academy 2016, a program run from July 19 to August 27 in order to teach Jeju’s residents about its traditional shamanism and history. 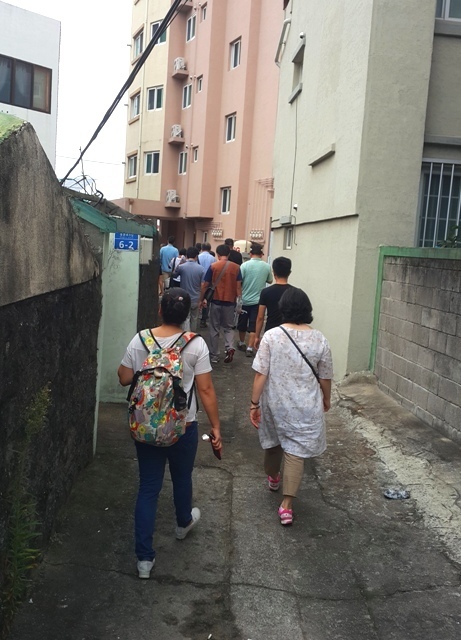 Tran’s tour visited parts of the city that are important to Jeju’s past. This included shrines, the old city walls and important roads in and out of the old city. However, before all that the meeting place was actually the Chilmeori Yeongdeung-gut exhibition hall. This is a recently opened museum at the heart of Sarabong dedicated to preserving and telling the story of the island’s shamanic rituals. Because of this, the first stop on the tour was a visit to one of these shrines. 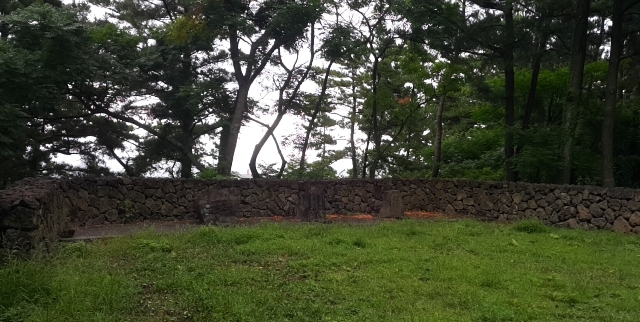 The Chilmeori shrine at the bottom of Sarabong hill is an important part of Jeju’s shamanism, especially in the city. It is also the place where the Chilmeori ritual is held annually. During this ritual, held in February, residents ask the gods for protection in the seas and also for a prosperous year ahead. Interestingly, though, this is actually not the shrines original location. Due to development, the shrine was moved from an area on the other side of Sarabong to its current resting place. Its original location was closer to the sea due to the rituals importance to the haenyeo and fishermen of the village. As the tour continued we walked into the Dumaengi district. Tran explained that despite its seemingly central location this area was actually one of the first suburbs outside of the old city. Considering how, in modern terms at least, it felt like we were in a very central area of the city, it really made you realize that development on Jeju is not a new thing. The Dumaengi district is also one of the parts of the city hasn’t been touched much since its original development, making it the perfect place to see some original Jeju-style 70’s architecture. While other areas of the city were rejuvenated in the 90s and beyond Dumaegni was somehow forgotten. 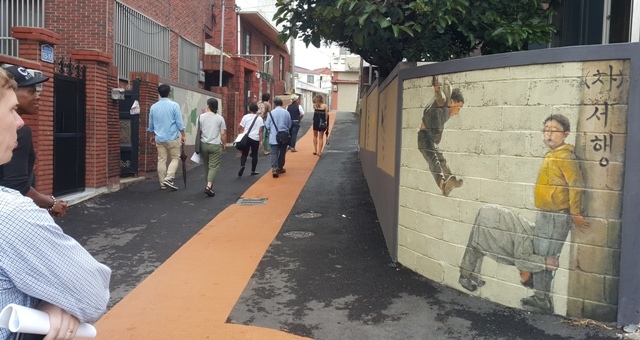 This lead to a project in the late naughties that let local artists and school children fill the area’s walls with paintings and murals depicting life in Jeju’s past. This gives the area a colorful and cheerful vibe and it is easy to imagine the children of the village playing around all those years ago. The next stop, however, went back much further in time to before the Japanese colonial period. Despite its narrow size, and the fact that it is now not much more than a side street, the east side gate and the tiny winding road it rested on was actually one of the main through points between Jeju city and the port of Hwabuk. Tran joked that despite it being small by modern standards, it was big enough for two horses which made it quite the main road back then. Of course reaching this gate meant that despite having been in the current Jeju city since the tour began we were finally getting close to reaching the original Jeju city area. This finally happened when we arrived at the area near to Dongmun market. Here we were able to view part of the remains of the old city walls themselves. These date back to the Joseon period and were designed to keep people both out and in the city. This led to an interesting story about a local man named Go Seo-heung and his memorial. Due to the heavy security on the main north and south gates people who wanted to leave the city to trade often tried to do so by scaling the walls. As such this lead to a significant number of accidents. While the residents tried to get the funds to build a better path, Go was able to donate up to 300 seok of rice which helped pay for the road. One of the oldest stops on the tour was the Dongjabok/Mansusa temple site. This likely dates all the way back to the Goryeo dynasty of (918-1392) and includes a statue of Maitreya, the buddha of the future. Despite its similarity to Jeju’s famous dolharubang, it has differing facial features that mark it out as a statue Miruek. The final stop of the tour was to Kim Man-deok’s tavern. Kim Man-deok was a tavern owner who after making her fortune running a tavern used by merchants and travelers, gave a large amount of it away to help feed the island during the famine. The famine caused by the poor harvest killed thousands of Jeju residents but was partly alleviated after Kim Man-deok bought up 51 tons of rice and allowed the government to distribute it to people on Jeju. 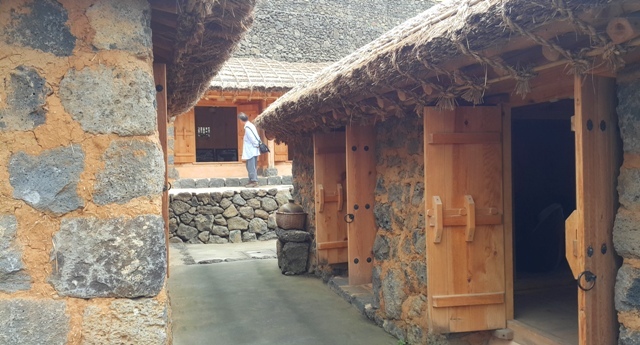 This tour made it clear that despite seeming like a very modern city, there are still many interesting parts from Jeju’s past dotted around the city. If you scratch beneath the surface a bit, you may be surprised at what you find.